Their works explore the many nuances afforded by the medium of Acrylic and pen on Canvas. 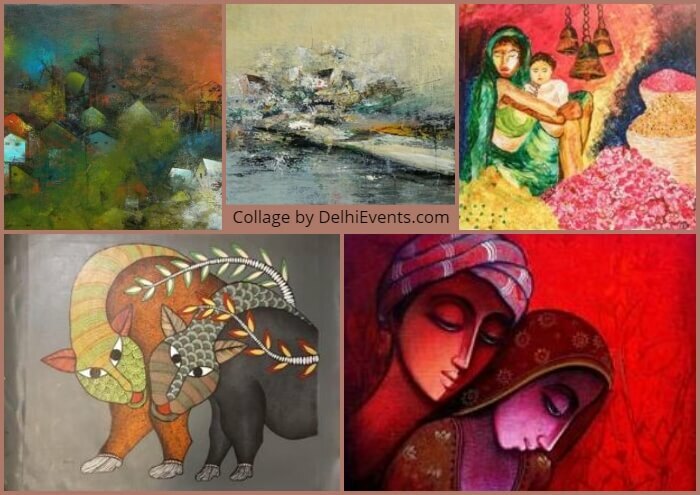 The exhibition reflects a mesmerizing and beautiful art with the signature trade mark of being affordable that bring a widest range of art from mystic to abstract, fluid to contemporary. Art depicts vivid colours, pastel shades yet meaningful perspective and connect with the soul. ‘Navya Naveli’ is a medium and a mode, a method and mood of Joy, peace and harmony. Ram Onkar and Anjali Sharma contrasting brushwork signifies a persistent fascination. Whereas artist Mithilesh Shyam and Anandbedrala their practice of drawing, like painting, is a subject in its self, their style of drawing are thus the opposite of pure sensation seeming to be impulsive in fact they are highly constructed artists. While M Singh and Anjane Guleria both are an artist who sees the world through fragments of color, fragment of memory, fragments of space.